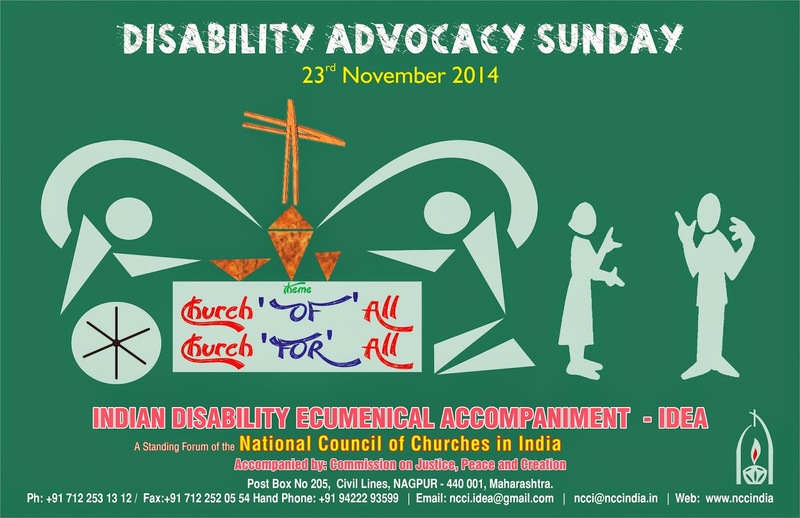 National Council of Churches in India: DISABILITY ADVOCACY SUNDAY - 2014. Disability Day, or the International Day of People with Disability, is a day that is sanctioned by the United Nations. The aim of Disability Day is to encourage a better understanding of people affected by a disability, together with helping to make people more aware of the rights, dignity and welfare of disabled people. Disability Day was founded in 1992 and is a day that is marked around the world by a variety of events held in many countries. The original name for this day was the International Day of Disabled Persons. The day's origins date back to 1981 and the International Year of Disabled Persons, which was created to improve the lives of disabled people all around the globe, as well as to prevent disabilities from occurring in the first place. The Day is used for holding discussions, forums and campaigns relating to disability, and communities are encouraged to organise performances in their local area. These can range from hosting a musical to a play, and disabled people should be involved in these productions. The overall aim is to show that a person with a disability can be a vibrant member of society. Each year the day is celebrated there is an emphasis on a new aspect related to improving the lives of people living with a disability. In 2012 there was a call to help disabled people live in an inclusive society in every country, and to make sure that society was as accessible as possible for disabled people. Leader: God has forgiven all those who have truly repented of their sins and has cleansed us from all our iniquities, and God admonishes us to sin no more. Amen. § A Resolution on Disabilities, Christian Reformed Church Synod, 1985. § That All May Worship: An Interfaith Welcome to People with Disabilities, National Organization on Disabilities, 1997. § At Worship with the Disabled, National Liturgy Office, CCCB, Canada, 2006. § Disability Awareness and Music and Worship Resources, Believers in the Word Full Gospel Ministry, Georgia, 2010. § Members of Indian Disability Ecumenical Accompaniment (IDEA), Commission on Justice, Peace and Creation, NCCI, 2011.